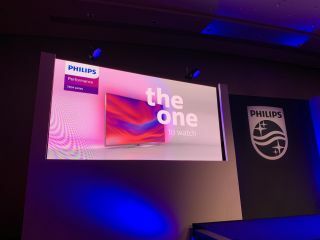 Philips announces The One – a TV for the masses | What Hi-Fi? As well as announcing two new OLED models for 2019, Philips has just taken the wraps off a middle-ranging model that it claims is the perfect blend of performance and price. Size, price and release date information are currently fairly thin on the ground, but we do have limited details of the TV, which the company apparently wants us to refer to as 'The One' (it does also carry a part number of 7304, however, identifying it as part of the mid-tier 7000-series). 'The One' will be an LCD model with some top specs: the new version of the company's P5 Perfect Picture Engine, three-sided Ambilight, Dolby Vision, HDR10+ and Dolby Atmos (although it will not have Bowers & Wilkins sound as seen on 2018's OLED 903). It will run Android TV, as the majority of Philips TVs over the last couple of years have, and will get Google Assistant as part of the package. That feature list makes the new model sound decidedly high-end, but Philips insists this will be a core model with an accessible price attached to it. We're expecting more information - and perhaps even a hands-on with a sample set - very soon, so watch this space.